Coulter Banned For Trump? Ridiculous! 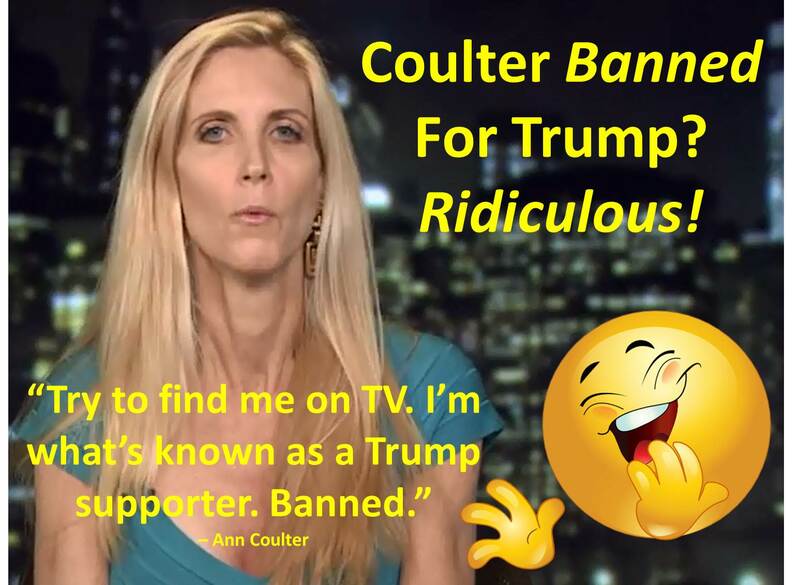 Coulter banned for supporting Trump? Is Coulter’s claim true? 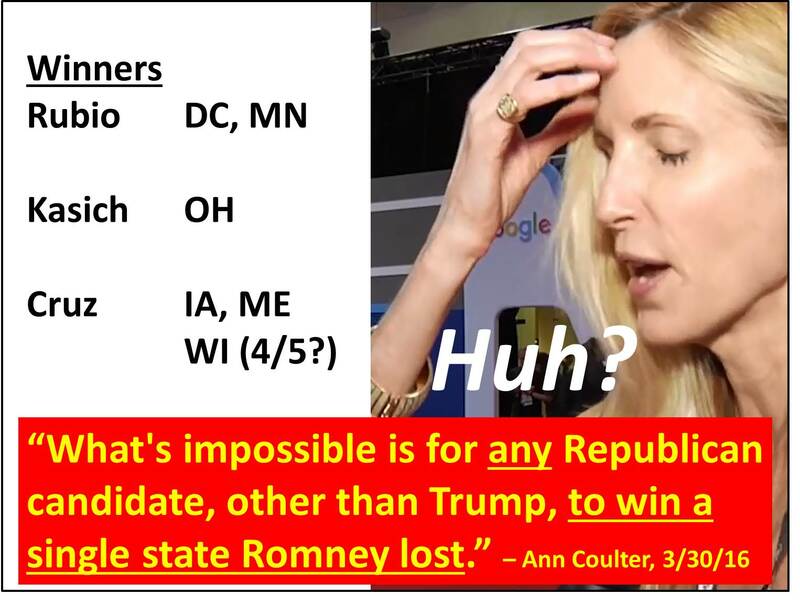 Will you believe your own eyes or believe Coulter’s lies? Trump supporters are all over the airwaves. Trump is all over the airwaves. In fact, Trump has already received over $2 billion of free publicity this election cycle. What about Fox News, Coulter’s former home base (she has appeared on that network at least 450 times)? Fox News has given Trump tons of favorable coverage and bent-over-backwards to defend him. In fact, Fox just aired a one-hour, prime-time special for Trump last night (On the Record) and will air another one-hour, prime-time special with Trump on Hannity tonight, immediately preceding the crucial Wisconsin primary to be held tomorrow. So, why hasn’t Coulter appeared on Fox News since September 17, 2015? Is it, as she claims, because she is a Trump supporter? Obviously not. If Coulter has been banned from Fox News (the only network she really cares about), it is not because she is Trump’s biggest supporter and consigliere. Rather, Coulter’s own behavior and obnoxious views have precipitated a sharp decline in the attention which would normally be lavished upon her. The tipping point occurred in mid-September when she first attacked Jews, then Catholics. Coulter’s infamous rant against Jews cost her both speaking engagements and television appearances. She had been slated as a presenter for both Media Research Center’s Dishonors Awards and David Horowitz’s Restoration Weekend. She was discretely disinvited from both of those prestigious events. 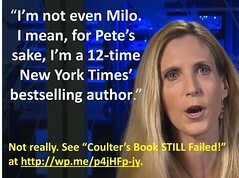 Coulter’s phony excuses failed to convince critics and fans alike. 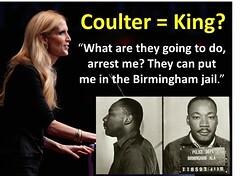 On the heels of her anti-Semitic tirade, Coulter went on an anti-Catholic rant, the first of several to come. Coulter repeatedly attacks Catholics for being Catholic. She just won’t stop. Playing the victim, Coulter is nevertheless the victimizer. Vanity hinders her repentance, something she has always been loath to do. Until she does, she should be shunned. In the meantime, she is desperately in need of your prayers. See “I Am Victim, Hear Me Whine,” The Beauty of Conservatism, 2011, is available as a free download at www.coulterwatch.com/beauty.pdf. Ann Coulter must be living in a bubble. Election coverage must have somehow escaped her. Actually, many of those Romney defeats were turned into non-Trump victories in primaries and caucuses already held! Rubio won in Minnesota and Washington, DC. Kasich won in his home state of Ohio. Cruz won in Iowa and Maine, and it looks like he is headed for a resounding victory in Wisconsin next Tuesday. Non-Trump GOP candidates have, thus far, won five states (soon to be six) that Romney lost in 2012. How about one who can keep up with the news?